When Ray Choto got a call inviting him to team up on "one of the biggest data projects ever," the reporter for VOA's Zimbabwe service couldn't resist. He joined hundreds of other members of the International Consortium of Investigative Journalists (ICIJ) in reviewing more than 11.5 million documents leaked from the Panamanian law firm Mossack Fonseca. Their findings from the so-called Panama Papers began rolling out Sunday, revealing a vast global network of secret offshore tax havens for the privileged and the powerful. Choto's initial report detailed how Zimbabwe's leading platinum mining company, Zimplats, allegedly funneled managers' salaries through an offshore company, violating the country's exchange control rules. Zimplats' majority shareholder, South Africa's Impala Platinum (Implats), has called for "an urgent investigation." The documents also showed that Mossack Fonseca clients include 23 people who've been sanctioned for supporting regimes in Zimbabwe, North Korea, Russia, Iran and Syria, Choto reported. 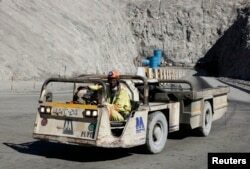 FILE - A worker drives a vehicle at Zimplats' Ngwarati Mine in Mhondoro-Ngezi May 30, 2014. Leaked documents allege Zimplats used an offshore company to pay management salaries without the knowledge of the Reserve Bank of Zimbabwe. He's also pursuing other leads found through the tedious, exacting process of sorting and reviewing data, looking for patterns, then following up with countless hours of reporting. The VOA reporter is one of 370 journalists, scattered among more than 100 news organizations in roughly 80 countries, working with the Washington-based ICIJ. The broad collaboration nonetheless is "an exclusive project, not open to any journalist. There's a lot of vetting that has to be done," said Choto, who has been involved with ICIJ since 2001. ICIJ Director Gerard Ryle told VOA that more than half of the reporters on the project are not ICIJ members, but collaborating with these journalists is a key part of the group's publication strategy. "In the traditional American nonprofit [journalism] model, you get funding … and at the end of the project you approach a publication partner. I think a better way of doing it is getting the publications involved from the start. … You're able to basically parlay the value of the story to get the resources of all the media partners." Choto built a reputation for strong investigative work at The Standard in Harare, Zimbabwe. In 1998, the journalist linked some cabinet ministers, police officials and business people to drug rings and money laundering. The following year, he reported that 23 Zimbabwe military members, including some officers, were jailed for conspiring to overthrow longtime dictator Robert Mugabe. Choto says he and his publisher were arrested and tortured for refusing to divulge the names of military sources. "I was beaten with wooden planks on my naked body," Choto said, adding that his captors also "would apply electric shocks. The torture was for three days; my editor was held for 10 days." The two were released after steady publicity from South African media pressured the government to relent. Choto and his editor, Mark Chavunkuka, later were jointly honored with the International Press Freedom award. FILE - A screenshot of the Panama Papers Web site, April 3, 2016. Choto came to the United States in the fall of 2000 as a Knight Journalism Fellow at Stanford University. Three years later, he joined Voice of America in Washington. Now 54, he covers breaking news while also continuing investigative work. Early last year, he collaborated with ICIJ on an investigation into the foreign accounts of international banking giant HSBC. Its Swiss private banking arm "made huge profits by allegedly engaging in shady deals of over $270 million with some Zimbabwean citizens seven years ago, in the process, disadvantaging the poor southern African nation of the much-needed foreign currency," he wrote for VOA. That story arose from files shared with ICIJ by the French newspaper Le Monde. ICIJ's Ryle told WIRED that the Panama Papers' document trove represents the biggest leak in history, "about 2,000 times larger than the WikiLeaks state department cables." The journalists worked in secret on the files — some of them for up to a year — sharing information via secure websites and avoiding email or any other communications that might compromise confidentiality, according to WIRED. Journalists have a proprietary claim on information relating to their own countries, Choto said, and they pass along information they discover that might be useful to a foreign colleague. FILE - People demonstrate against Iceland's Prime Minister Sigmundur Gunnlaugsson in Reykjavik, Iceland, April 4, 2016. His ICIJ colleagues have turned out stories of possible misdeeds. While offshore havens themselves are legal, their lack of transparency makes them attractive for hiding crime and corruption. In Iceland, Prime Minister Sigmundur Gunnlaugsson, tendered his resignation Tuesday, a day after angry crowds gathered in Reykjavik to protest what they suspect was an effort to hide assets offshore. Close associates of Presidents Vladimir Putin of Russia and Xi Jinping of China also have been linked to the law firm's secretive services. Choto suspects Zimbabwe residents "are excited in their hearts" about his findings, but he says his homeland "is one of those places where people cannot freely express themselves, to go out and demonstrate … unless you belong to the ruling party. … You've seen people being beaten for demonstrating peacefully." He continues digging into the Panama Papers. "There are a lot of amazing stories that are still to be told."